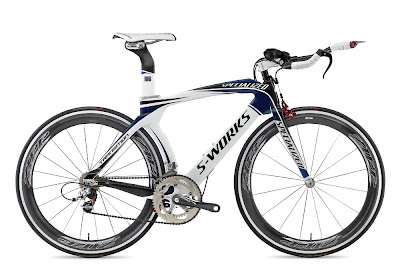 As an enthusiastic owner of a Specialized S-Works Tarmac, I have long been impressed by the technology and design of this company’s bicycles. Of course, they have gone to a huge effort to market them, including placing them under some of today’s finest professionals. It is on my wish-list for when I move up from my cheap-but-cheerful Leader 735TT eventually. Three years ago, the company introduced its time trial/triathlon bike, the Transition, and it has appeared with great success in the pro peleton and under triathletes. Of course, for people with access to even more funding or support, it has been supplanted by the Shiv, ridden by Alberto Contador at the Tour de France last year and by Fabian Cancellara in his dazzling ride for gold at the World Championships in Switzerland. However, the first clouds on the horizon appeared when UCI officials made threatening noises about time trial bikes at last year’s Tour of California, and the storm broke with the banning of the Shiv at UCI-sanctioned events in February. I was nonplussed to see this morning, in our daily local triathlete e-newsletter, no fewer than three not-inexpensive Transitions offered for sale by some of the fastest time trial riders in Ottawa. It turns out that the Transition has been banned as well and although triathletes can ride them, the Ontario Cycling Association will enforce UCI regulations in provincial events. This means that these athletes, who have invested a great deal in buying and setting up their bikes, are pretty much out of luck. The only way to make them legal for time trials would be to saw off the fins that fair-in the area between the head tube and the down tube. The governing body in the United States, the USCF, will allow Transitions to be used by Masters group cyclists, probably because a lot of people own them. I believe that bike racing should be about the athlete and not the equipment but decisions like this impede the progress of technology, not to mention that for three years the bikes have been fine. The reshaping of tubes to take advantage of aeerodynamics is a minor change but an apparently effective one. The UCI is concerned that bike technology will advance beyond the reach of all but the elite. It is certainly much cheaper to engineer some fins into a tube than to use a disc wheel, for example, but the UCI allows other elements (the disc, aerobars, shoe covers, really goofy helmets) that clearly only have an aero function. Although I suspect I still will not catch the fast guys in Ottawa unless they ride mountain bikes in the time trials, I feel sympathy for them. I notice that on Specialized’s website, there is no mention of the UCI/Transition problem anywhere, so buyer beware. I saw that this morning too, and thank you for the explanation, being a newbie I didn't realise the impact of the "fins". The rules are incredibly complex but as I understand them the UCI does not allow additions to a bicycle that are primarily for aerodynamic rather than structural purposes. The Shiv has a kind of nosecone that fits in front of the headtube and it seems to be an addition. I think the fins on the Transition are molded into the structure but give no support to it and hence are illegal. My own time trial bike has an aero wedge shaped head tube, but it is the tube itself and cannot be removed without the bike falling apart. The top-of-the-line Transition lists at US$7700, so I would be pretty miffed if I had bought one (from one of the world's biggest bike manufacturers) and could not use it. thanks so much for your posting, I hope someone in the decision making world reads it!! Warren, for me the engine is inferior to the bike but when someone is up at your level, I am sure every slight advantage helps. Surely there must be triathletes interested in Canada's Fastest Time Trial Bike--good luck! As I understand them, not only do the UCI rules aim to prevent the use of aerodynamic aids, but also to ensure that bicycles are commercially viable by preventing extremely expensive one-offs. I was very impressed with the Transition, which, as usual with Specialized, comes in a fairly wide price range and would allow advanced technology to reach consumers. I do not understand how the banning of commercially-widely-available bicycles such as the Transition meets the stated goals of the UCI and it is sad that so many people are now unable to use these bikes as intended. Copenhagenize URL is fixed now. Thanks! The .com part did somehow fall off.